"I love using these as a healthier alternative to fries or chips with my meals. Very yummy!" Place zucchini in a bowl. Drizzle olive oil over zucchini and stir to coat; add bread crumbs and toss to coat. Spread coated zucchini onto a baking sheet. 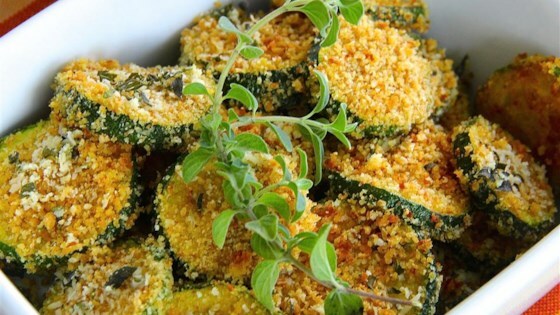 Sprinkle Parmesan cheese and oregano over coated zucchini. Bake in the preheated oven until zucchini are tender and cheese is browned, about 15 minutes. See how to make crispy, low-calorie baked zucchini chips. I have made these several times. Learned really quickly that they need to be sliced very thin and at higher heat, 425-450. Thicker ones were always soft. I listened to the reviews and cut thin then cooked at 450 for 30 minutes. I used plain bread crumbs and seasoned salt. This was great. My husband said save this recipe.